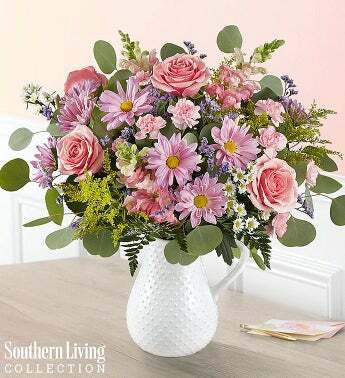 EXCLUSIVE Make her special day one to remember with our spring-inspired bouquet. Created exclusively through our collaboration with Southern Living™, this soft, feminine gathering of blooms is artistically designed inside our new Timeless Treasure pitcher, an elegant piece that inspires nostalgia with its vintage Swiss Dot design. Including a recipe for delicious Southern Sweet Tea, it’s a gift she’ll enjoy using again and again.